I have never felt as comfortable and beautiful as I did during my photo shoot with juli. My pictures are GORGEOUS. Not only will I be recommending Julianna Arendash photography to my friends, but I will return for another photo shoot. Where do I begin. Julia is an amazing photographer, I have never felt so comfortable with someone taking my picture before. Her style is amazing and the way she directs with her informative emails, a pretty precise schedule, and even the shoot itself. She helped pose me all the way down to my fingers and toes! I wanted to do this shoot to give myself a major confidence boost! It gave me just that. To see myself in a different light and to see what other tell me they see. 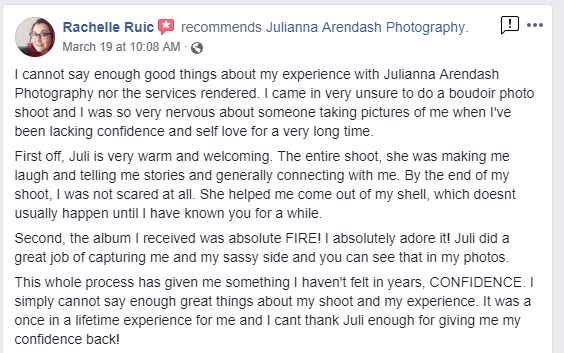 I would recommend Julia to everyone I know! This was an amazing experience for me. As soon as I walked in, Juli made me feel completely at ease. She’s so down to earth and easy to talk to. It was wonderful to be taken care of and have my hair and makeup done. The photos were beyond anything that I could have imagined! Simply beautiful. Julianna is so amazing!! She is so talented, kind, and knows how to make you feel comfortable! You won’t regret booking a session with her! Julianna is an amazing down to earth photographer. She makes you feel comfortable in a what could feel like an awkward situation. The pictures were all amazing and made me feel beautiful. I would definitely work with her again. "Julia is an amazing photographer, I have never felt so comfortable with someone taking my picture before. Her style is amazing and the way she directs with her informative emails, a pretty precise schedule, and even the shoot itself." Can’t even begin to tell you how awesome this experience was! Juli makes you feel so comfortable during the shoot. Not you mention she is amazing at what she does and the photos come out AMAZING. I can not wait to get mine, been excited about it since the day I ordered!! Juli is definitely you’re girl! Juliana is incredible to work with! She makes the entire process very comfortable and easy with the way she coaches you. Her personality is super lighthearted and fun which helps make you feel confident in every aspect. She’s a peach! My photos turned out perfect (I can’t wait to see the final product!). Her and Jess make an awesome team. There is something so amazing about doing these. I can't believe how much fun I had and how good I felt about the whole thing. I am so proud to be a part of such an amazing thing. I highly recommend everyone give it a shot I know you wont be disappointed. I can't wait to do it again. "She gives excellent posing directions, and even showed me what to do because I’m such a visual learner. The photos she took turned out AMAZING!! Several of them I saw and said, “no way is that me because I look so dang good! !” "
I was so nervous before my shoot. Juli was so awesome! She really helped me to relax and just have fun. I love the way my photos came out...my husband loves them too! I would definitely highly recommend doing a shoot with Juli. She’s so amazing!